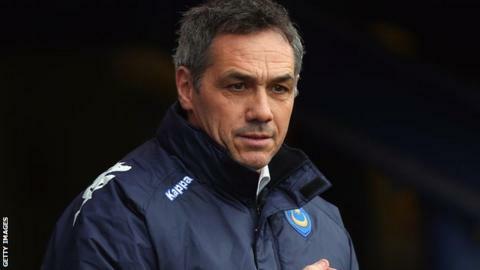 Portsmouth have terminated the contract of manager Guy Whittingham. He was relieved of his duties following a meeting with chairman Iain McInnes, chief executive Mark Catlin and finance director Tony Brown on Tuesday. The 49-year-old, who was appointed a year ago, leaves Fratton Park with the side 18th in League Two. Academy manager Andy Awford has been placed in caretaker charge and will be assisted by first-team coach Alan McLoughlin and striker David Connolly. Whittingham initially took charge of the Hampshire club on a temporary basis on 7 November 2012, following the departure of Michael Appleton to Blackpool. He was then appointed manager on a permanent basis in April on a one-year rolling contract following the club's exit from a 14-month spell in administration. Portsmouth were relegated from League One last season, finishing bottom of the table after a 10-point deduction. The 2-1 defeat at home to Scunthorpe on Saturday was Portsmouth's fourth successive defeat in all competitions. They are currently six points above the League Two relegation zone. A statement on the club website said: "Portsmouth Community Football Club regret to announce that Guy Whittingham has left his post as manager after his contract was terminated. "The club wishes to place on record its sincere gratitude to Guy for his service to the club during difficult times. "We have an important game against Southend United on Tuesday which we are fully focused on. "There will be no further statement until after this fixture."